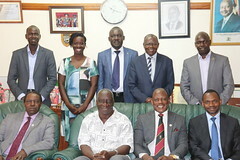 Kampala 13 April 2019 The Regional Universities Forum for Capacity Building in Agriculture (RUFORUM) is an implementing partner for the SENTINEL project. The SENTINEL is an interdisciplinary research project seeking to address the challenge of achieving ‘zero hunger’ in sub-Saharan Africa, while at the same time reducing inequalities and conserving ecosystems with special focus on Ethiopia, Zambia and Ghana. Through this project, RUFORUM will provide 27 PhD research scholarships. RUFORUM is a pleased to announce the award of 20 PhD research scholarships to applicants that responded to the second Social and Environmental Trade-offs in African Agriculture (Sentinel) call for PhD proposals. This is the second and final award under this project. The following are the successful applicants.